Toyota and Kevin Costner displayed the ‘Dancing with Wolves’ star’s heavily modified Tundra at the 2018 Specialty Equipment Market Association (SEMA) Show. Costner’s truck comes fitted with a range of custom equipment to make it both capable and comfortable to take out to the great outdoors. 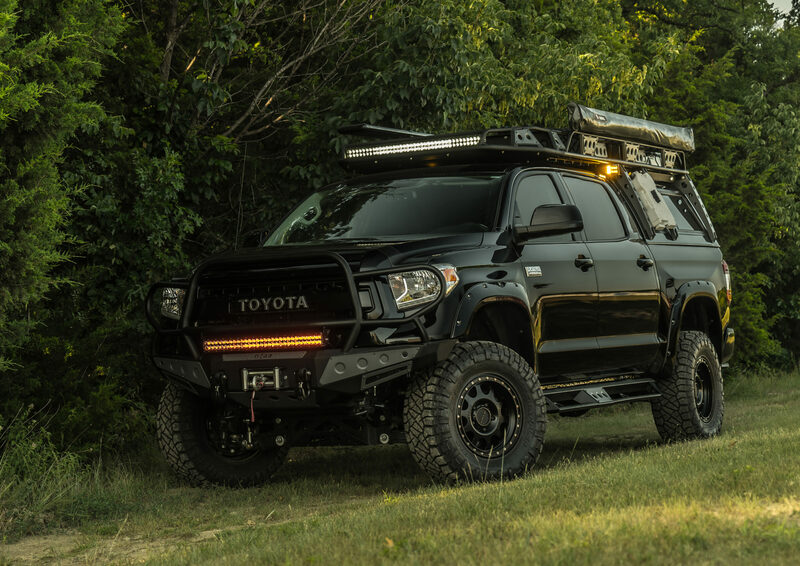 Photos show the truck with rugged front and rear heavy-gauge steel bumpers, heavy-duty winches, LED lighting bars and accents, and a two-piece roof rack that was specially designed to accommodate the truck cap that goes over the bed. It also gets a TRD exhaust, a 4.5-inch BDS suspension lift with Fox coilovers and shocks, an 18-inch Method Race wheels with burly 35-inch Nitto Ridge Grappler tires, and N-Fab side steps that run the length of the cab. Two security safes were installed inside, one under the rear seats and one at the center console, the bed comes with a dual-zone cooler for cold storage and it also sports TV monitors in the front-seat headrests and a padded sleeping area for Costner’s kids. “I was delighted to get a call from Kevin asking if we were interested in collaborating with some video content featuring the Tundra. Kevin is an avid outdoorsman and is very particular about the equipment he uses. The fact that he identified the Tundra as being the best truck to fit his needs says a lot about our products,” said Ed Laukes, group vice president – Toyota Division Marketing. “Kevin was involved with the project from start to finish. He had some drawings that he drew personally to convey his concept. I made some renderings based on his ideas, and then we flew out to his home to meet him and work out the final details. He knew exactly what he wanted. He made it challenging, but it was also a blessing. Some guys will just throw crazy ideas at you and expect you to make it happen, but he was willing to work closely with us to make his vision a reality,” said Complete Customs owner and chief builder Shaun Freilich.